This article is about how to live-trap feral cats so that they can be taken to the vet for spaying and neutering. 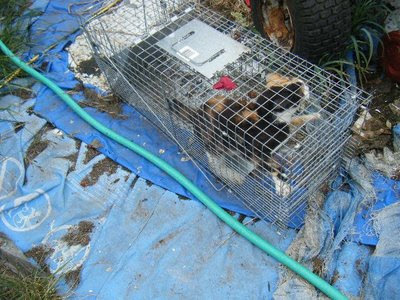 Trapping feral cats is an act of compassion that can lead to a healthier, smaller feral cat colony. 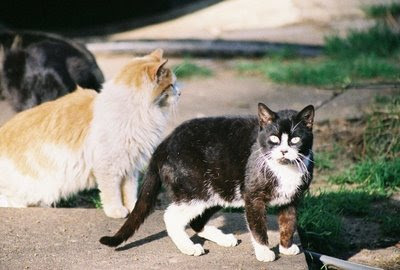 Most examinations of feral cat populations have shown that the best practice for reducing population size and improving health is to live-trap, spay/neuter and then release feral cats back to the colony. Cat-haters disagree, of course, and they have the attention of media in general. But you already know this is the right thing to do so we're not going to rehash cat-hater pseudoscience. A live trap big enough for a feral cat. There are several types and I will show you two, here. Just have a decent trap and learn how to use it before trapping day. A tarp or blanket to cover each trap. An old towel or two for each trap to put on its floor to keep the cats from being injured by the wire. Alternatively, newspapers. Presumably, you know where the feral cats hang out in your area. 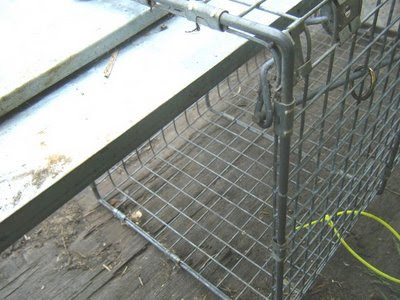 It's important to set your trap in an area with heavy feral cat traffic and few other animals if possible. I have to make regular veterinarian appointments where I live, so I plan my trapping activities for the afternoon before the appointment. This is important because once the cat is in the trap, it’s there to stay until after its appointment. You need a trap that's big enough for feral cats. There are several brands, the big ones are Tomahawk and Havahart. Tomahawk makes some of the nicest double-door traps (one trap door, one release door) but I can't afford them. So I've never used anything but single-door live traps specifically sized for feral cats. Even though I'm on a tight budget, though, I've avoided off brands because people seem to have a lot of complaints about them (like, missing parts, broken parts when new, etc). So I suggest sticking with traps from the big manufacturers, purchased from a reputable source. This trap is one piece and does not collapse. It has only one door. 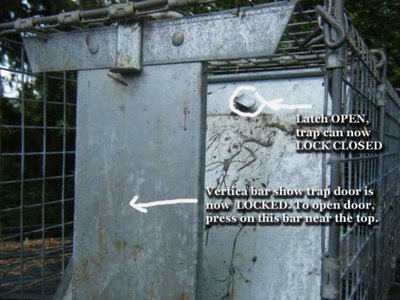 One point of caution for this particular design: this trap has a lock-open lever shown here which must be turned or the trap will not lock shut. It will still BE shut, as you can see, but a cat can push it open from the inside. 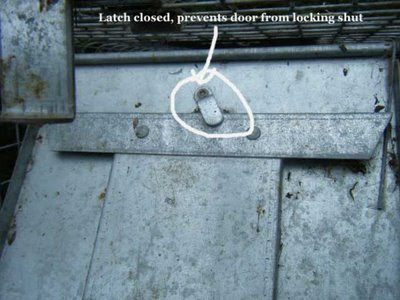 This shows the lock-open mechanism released so that the trap locks shut. To open it anyway, you just push in the middle of the vertical bar you see here. But it can no longer be opened from the inside. This trap is also collapsible so you can fold it up for storage if needed. The whole collapsing process is clunky and annoying but if you need it, it's a good thing. Like all traps you will want to hold the mechanism in place while you bait the trap, then you want to set the trap latch close to its trip position. I usually do this while setting the trap on a step or other elevated surface so I can reach in to put the food in. Then I set the mechanism and carefully move the trap to my pre-chosen location. If there are feral cats around, you won’t have to wait long. 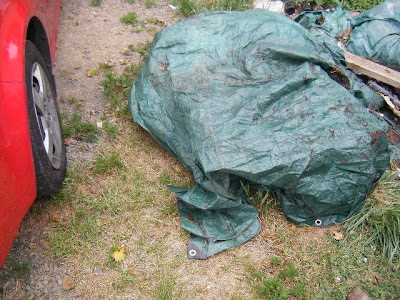 Although I’m not showing it here, I usually use a tarp or blanket to partially cover the closed sides of the trap. This increases trapping speed and also keeps the cat from hurting itself in a panic when the door closes… and the WILL panic! A cat in a trap is very scared, especially if it is a feral. Try to look quickly for ear markings and to make sure it isn’t just a neighbor’s pet, then cover the trap and move it to its overnight storage location for the night. One nice thing about the Havahart traps is the divider that allows me to isolate the feral temporarily at the back of the cage so I can put some old towels in for cushioning. An alternative is newspaper – your vet may specify the conditions and you should follow whatever he/she says. Most veterinarians will tell you that these candidates for surgery cannot have food after 8 pm or so (depending on surgery time) but they CAN have water: One of my traps will accept a hamster/guinea pig waterer on the side of the cage. This looks goof but works great. 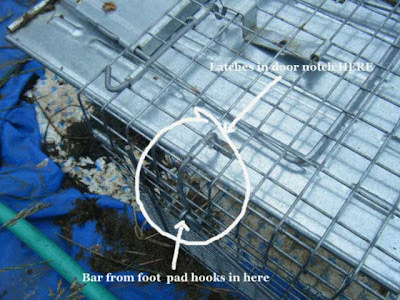 On the other trap, I usually use a small cleaned-out cat food cat or two, which I set under the door-end of the trap, where the cat can lap water through the screen. It’s clunky, but when dealing with feral cats you don’t want to be sticking your hand in there. Some vets have a no-water rule, too. I've worked with both without problems. And if your vet says water is okay but you can't figure out how to safely give water to your feral then don't panic: As I said, some vets don't want you to give water anyway, the night before surgery. They will be okay. When you pick up a feral to bring it home, you’ll still need to keep it in the cage and in a warm place overnight. You can release it in the morning if there are no complications, although for females (where complications are more likely) I'd suggest giving them a couple of days to recover (with food and water, of course) if you are able to do that.. You’ll need to plan ahead for a safe and warm location where you can leave the trap while going through this waiting period. Well, we've covered trapping, neuter/spay and now we'll mention the "return" part of the T-N-R process. Cats are territorial and they tend to have their home turf memorized, so the best place for them is back in the area they knew so well. Relocating feral cats should be avoided if possible: it is highly stressful for the cats and they are most likely to venture off, trying to find their way back to their home territory. If you must relocate for some reason, you'll need to use a relocation cage, which is larger and has provisions for a cat box, food and water. You'll need to find a SAFE place for the relocation cage in the new territory, and keep them in the cage with food and water for about a month. They'll need to be in a place that is safe, as I said, and one that can give them a view of their new territory so that they can begin familiarizing themselves with it. It's hard work and not recommended, as I said, unless relocation is imperative. Therefore, don't do this unless you're willing to invest the time and effort into a successful relocation. I’m probably forgetting to mention some things but I’m sure someone will remind me. This gives you a start at least. And thank you for being a humanitarian. 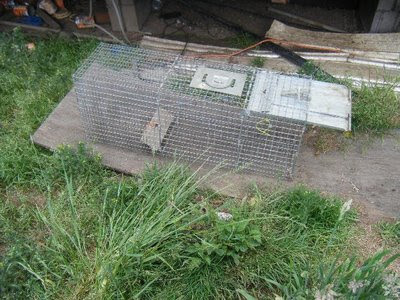 Just to cover all of the bases, here is a link to another set of instructions for trapping and rescuing feral cats. It probably covers some things I forgot to mention: Humane trapping instructions. I guess it depends on the vet. Both of the two vets we use have the same rule as I quoted but I understand some doctors have other ideas. 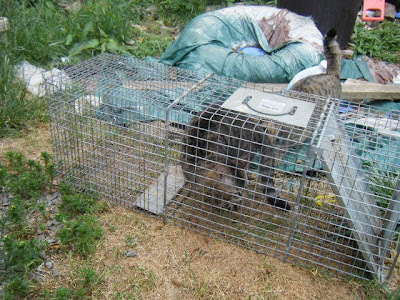 Over the past few weeks I have managed to trap/neuter/return six feral cats who live on our allotment in Birmingham UK. The latest one was neutered seven days ago but since she was brought back to us she has disappeared. Before, she would come for food almost every morning. I am getting quite worried about her now. Is it normal for feral cats to do this? The other cats were back for their food the day after their operations. Betty, it's not unusual for a cat to go into hiding for a few days right after surgery. I always worry when this happens but I tell myself it's just recuperation time. However, we've also lost a couple of them from post-surgical complications. We try to watch for those and keep the cats caged for a couple of days just to make sure that they are acting normally. Still, things get by us on a rare occasion. That is part of why I worry so much if a cat doesn't reappear after three or four days. There is no specific timetable, though, and I've had cats take two weeks or more to get back to their regular routine. There is just no way to tell. Hopefully you will see her again soon. Please note that a trapped cat should never be left outside unattended...a proper holding space needs to be warm, dry, AND secure...from humans and other animals. Spay and Neuter for a better future!!!" Wish me luck. I am from Pennsylvania and take care of a colony of feral cats and have been for years, so I do have alittle trapping experience. I would like to hire someone to trap a cat for me. Is there such a thing and if so, can you make some suggestions who I would call or where I would start? Check your local paper for rescue groups in the area. Rescue groups often hold adoption fairs for animals. There's almost always someone. 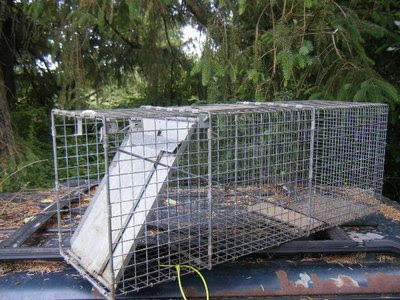 Or ask a local veterinarian; they know who does trapping, too.